(b. 1935) – a writer and journalist. She was born to a Jewish family in Warsaw. During World War II, many of her relatives were killed, and she managed to avoid transportation to the ghetto, being hidden by her rescuers for the rest of the occupation period. After the war, she stayed in an orphanage in Otwock. Then she studied journalism at the University of Warsaw; after graduation, she took up a job the Życie Warszawy newspaper and then in Polityka, for which she worked as a correspondent in the USSR from 1966 to 1969. Her reportages from that period were published in the debut volume Na wschód od Arbatu [To the East of Arbat] (1972). Five years later, she gained international fame thanks to the publication of her most popular book Zdążyć przed Panem Bogiem [Shielding the Flame] – an interview with Marek Edelman, one of the leaders of the Warsaw Ghetto Uprising. She is also the author of two novels: Sublokatorka [The Subtenant] (1985) and Okna [Windows] (1987); both of them were originally put out by foreign publishing houses and were available only as underground publications in Poland. Her literary output encompasses several prose and reportage books, including Hipnoza [Hypnosis] (1989), Dowody na istnienie [Evidence for Existence] (1995), Wyjątkowo długa linia [An Exceptionally Long Line] (2004), Król kier znów na wylocie [Chasing the King of Hearts] (2006), Różowe strusie pióra [Pink Ostrich Feathers] (2009) and Biała Maria [White Mary] (2011). 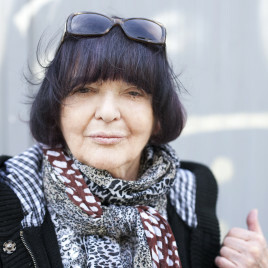 She has won many prestigious awards, including the Władysław Reymont Literary Prize and the Julian Tuwim Literary Prize. She was also nominated for the Nike Literary Prize and the Angelus Central European Literary Award. Both in her novels and reportages, she focuses strongly on the experience of the Holocaust. In her numerous texts she tries to describe the reality where the tragic events of World War II have left wounds that cannot heal.